CAN'T FIND THE 2019 Chevrolet Silverado 2500HD VEHICLE YOU ARE LOOKING FOR? 1Not available with special financing, lease and some other offers. See dealer for details. 2KEYES CHEVYTOWN CUSTOM	GM 4" BLACK ASSIST STEPS	GM FLAT CONTOURED MUD FLAPS	GM SMOKE VENT SHADES 3Not available with special financing, lease and some other offers. See dealer for details. 4Lease Loyalty Purchase Private offer to eligible 2014 Chevrolet, Buick GMC or Cadillac lessees only toward the purchase only of certain Chevrolet vehicles. See dealer for details. 5Conditional offer. Not available with all other offers. Stackable % Cash Back for customers who have owned or leased a 2005 or newer non-GM vehicle for a minimum for 30 days. See dealer for details. 6Must qualify through GM Financial. Cash usable only if financed through a supported or unsupported GMF contract. Average example APR 5.9% for qualified buyers. Not available with special financing, lease and some other offers. Take delivery by 4/30/19. See dealer for details. 7Must qualify through GM Financial. Not available with special finance, lease, or some other offers. Take delivery by 04-30-2019. See dealer for details. 1KEYES CHEVYTOWN CUSTOM	GM 4" BLACK ASSIST STEPS	GM FLAT CONTOURED MUD FLAPS	GM SMOKE VENT SHADES 2Lease Loyalty Purchase Private offer to eligible 2014 Chevrolet, Buick GMC or Cadillac lessees only toward the purchase only of certain Chevrolet vehicles. See dealer for details. 3Conditional offer. Not available with all other offers. Stackable % Cash Back for customers who have owned or leased a 2005 or newer non-GM vehicle for a minimum for 30 days. See dealer for details. 4Must qualify through GM Financial. Cash usable only if financed through a supported or unsupported GMF contract. Average example APR 5.9% for qualified buyers. Not available with special financing, lease and some other offers. Take delivery by 4/30/19. See dealer for details. 1Not available with special financing, lease and some other offers. See dealer for details. 2KEYES CHEVYTOWN CUSTOM	18" BLACK RHINO WHEELS	NITTO RIDGE GRAPPLER TIRES	TRUXXX LEVEL KIT WITH ALIGNMENT	MOUNT BALANCE & TPMS SPIKE LUG NUTS	CHEVROLET CENTER CAPS	NITRO FILL TIRES	CREDIT FOR TAKE OFF RIMS & TIRES	ACCESS ROLL UP TONNEAU COVER	GM FLAT COUTOURED MUD FLAPS 3Not available with special financing, lease and some other offers. See dealer for details. 4Lease Loyalty Purchase Private offer to eligible 2014 Chevrolet, Buick GMC or Cadillac lessees only toward the purchase only of certain Chevrolet vehicles. See dealer for details. 5Conditional offer. Not available with all other offers. Stackable % Cash Back for customers who have owned or leased a 2005 or newer non-GM vehicle for a minimum for 30 days. See dealer for details. 6Must qualify through GM Financial. Cash usable only if financed through a supported or unsupported GMF contract. Average example APR 5.9% for qualified buyers. Not available with special financing, lease and some other offers. Take delivery by 4/30/19. See dealer for details. 7Must qualify through GM Financial. Not available with special finance, lease, or some other offers. Take delivery by 04-30-2019. See dealer for details. 1KEYES CHEVYTOWN CUSTOM	18" BLACK RHINO WHEELS	NITTO RIDGE GRAPPLER TIRES	TRUXXX LEVEL KIT WITH ALIGNMENT	MOUNT BALANCE & TPMS SPIKE LUG NUTS	CHEVROLET CENTER CAPS	NITRO FILL TIRES	CREDIT FOR TAKE OFF RIMS & TIRES	ACCESS ROLL UP TONNEAU COVER	GM FLAT COUTOURED MUD FLAPS 2Lease Loyalty Purchase Private offer to eligible 2014 Chevrolet, Buick GMC or Cadillac lessees only toward the purchase only of certain Chevrolet vehicles. See dealer for details. 3Conditional offer. Not available with all other offers. Stackable % Cash Back for customers who have owned or leased a 2005 or newer non-GM vehicle for a minimum for 30 days. See dealer for details. 4Must qualify through GM Financial. Cash usable only if financed through a supported or unsupported GMF contract. Average example APR 5.9% for qualified buyers. Not available with special financing, lease and some other offers. Take delivery by 4/30/19. See dealer for details. 1Lease Loyalty Purchase Private offer to eligible 2014 Chevrolet, Buick GMC or Cadillac lessees only toward the purchase only of certain Chevrolet vehicles. See dealer for details. 2Conditional offer. Not available with all other offers. Stackable % Cash Back for customers who have owned or leased a 2005 or newer non-GM vehicle for a minimum for 30 days. See dealer for details. 3Must qualify through GM Financial. Cash usable only if financed through a supported or unsupported GMF contract. Average example APR 5.9% for qualified buyers. Not available with special financing, lease and some other offers. Take delivery by 4/30/19. See dealer for details. 4Must qualify through GM Financial. Not available with special finance, lease, or some other offers. Take delivery by 04-30-2019. See dealer for details. 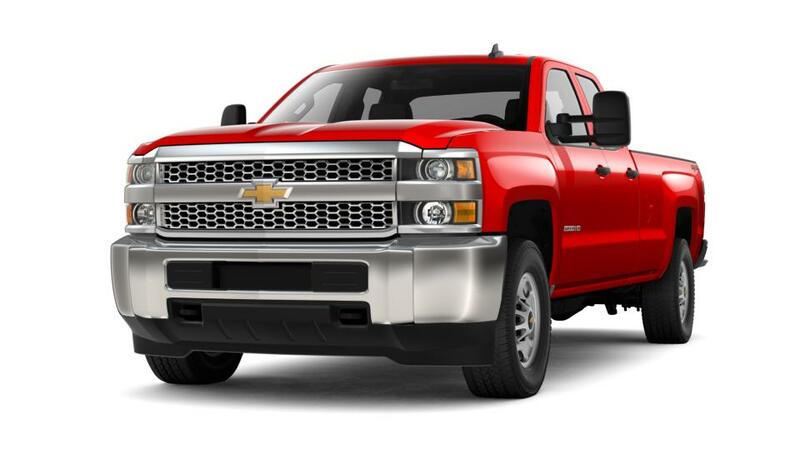 Keyes Chevrolet typically keeps a large stock of 2019 Chevrolet Silverado 2500HD vehicles to satisfy the needs of our customers in Durand and Eau Claire. In the event you don't see the exact 2019 Chevrolet Silverado 2500HD vehicle you're looking for in our inventory, please, let us know so we can locate it for you! Keyes Chevrolet has been serving Western Wisconsin and Minnesota since 1946. Let us assist you in your purchase of a 2019 Chevrolet Silverado 2500HD today!